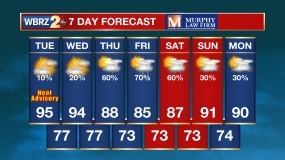 CLICK HERE to watch Meteorologist Matt Callihan's update on Saturday's forecast. Widespread, occasionally heavy rainfall is expected on Saturday. While some flooding could occur in typical trouble spots, the short duration of the event should prevent any serious issues. Today and Tonight: An area of low pressure will develop over Texas on Friday sending cloud cover and showers into the region by evening. Not all will receive rain on Friday, but the umbrella is a good contingency for date night. Expect high temperatures in the low to mod 60s. Overnight will be cloudy with showers increasing from west to east near daybreak. Lows temperatures will stop in the low 50s. The National Weather Service has issued a FLASH FLOOD WATCH for St. Mary Parish. There, 3 to 5 inches of rain and isolated higher amounts will possible. Low lying, poorly drained, areas are the locations with the greatest potential to see flooding issues. 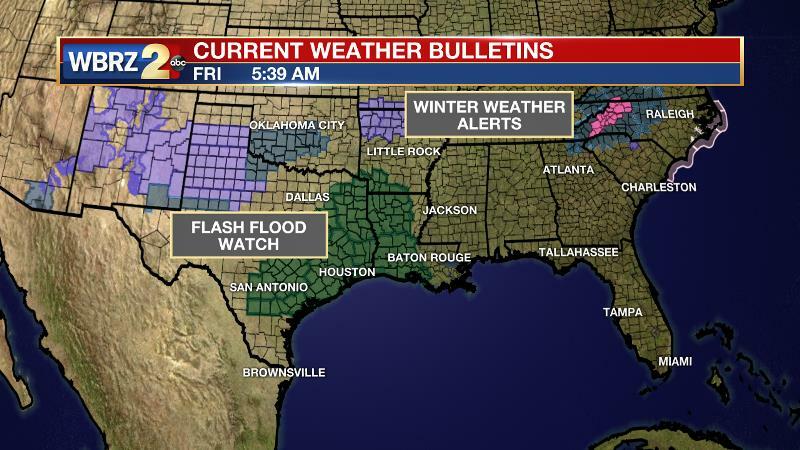 Winter weather bulletins have been from the Midwest to Carolinas for significant snow and ice on the north side of this storm. Up Next: A significant amount of moisture will accompany a storm system across the central Gulf Coast on Saturday leading to widespread rain. Two to three inches could fall through Saturday night. Since there has not been heavy rain in quite a while, most grounds should handle this fairly well and river flooding is not expected. However, with downpours in a short time, streets and poorly drained areas may briefly flood. This would be most likely in the typical trouble spots. 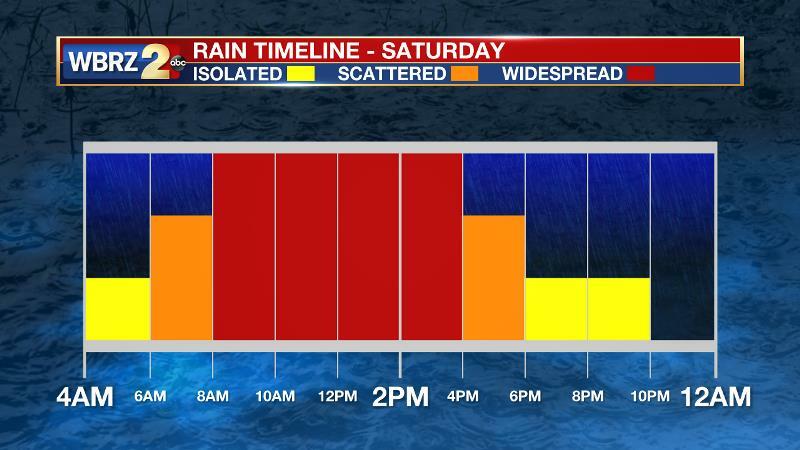 The steadiest, heaviest period of rain is expected between 6am – 4pm. High temperatures will break into the 60s during this time, but dry and chilly conditions will return on behind a cold front. Showers will end from west to east Saturday night, but clouds could linger through much of Sunday. A shortwave trough moving across the southern third of the country will be the catalyst for active weather across the Midwest and Gulf Coast through the weekend. This trough will cause a surface low pressure system to strengthen over Texas on Friday. This will increase the southerly flow, priming the atmosphere with abundant moisture and precipitable water values near records for the time of year. Forecast models remain in good agreement that the low will track east, northeastward across Texas and the Gulf Coast with widespread heavy rain—especially on Saturday. Fortunately, this will be a fast moving system, which will limit total rainfall amounts, but strong forcing created by the low, ample divergence aloft, and very high atmospheric moisture content will lead to two or possibly three inches of rain in many locations. The Weather Prediction Center indicates a 2 out of 4 “slight risk” for excessive rainfall. Rivers should be able to tolerate this runoff, but typically flood prone areas could have some issues on Saturday. Additionally, forecast models continue to keep instability confined to coastal areas. There will be some severe thunderstorm potential in those areas with just a few rumbles of thunder further inland. A slight shift inland by the surface low could bring the threat of severe thunderstorms farther north towards the I-10 corridor. Much cooler than average temperatures will return for the first part of next week.